What was Zachary’s best gift from his first birthday? Surprisingly, his grasshopper puppet which he is still obsessed with. 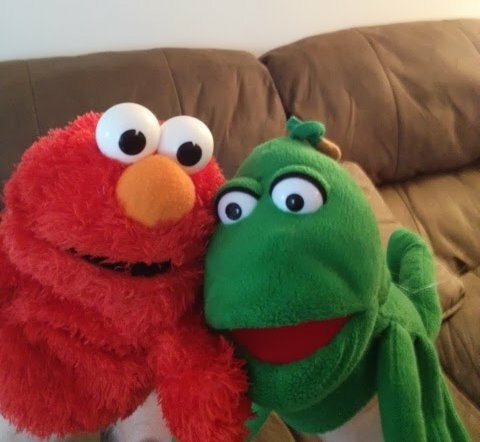 Along with grasshopper, he is also obsessed wit his Elmo puppet. Literally, every day he insists that I put these puppets on so they can perform for him. 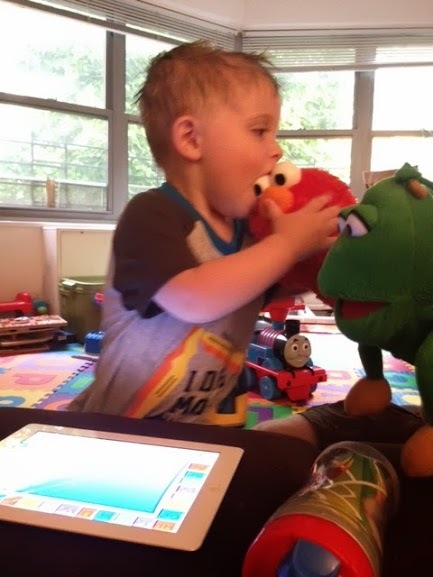 Zachary also really likes to interact with these puppets. At first, Zachary would do cute things like give grasshopper a hug or Elmo a high five. He would even pretend to feed them coffee or pizza. More recently, the relationship has turned abusive. Zachary now loves to jump on and bite the puppets. He will stick toys or his hands in their mouths and crack up when I try to stop him. I keep telling Zachary he is being abusive and he should be nice to his puppets but that only encourages him to further abuse the. Zachary does not act out with other kids or us, it is just his puppets because for some reason it is hilarious to him. I don’t get it but he loves his puppets.